In recognition of standing up for her students and their right to read, South Carolina Association of School Librarians gave Wando High School Principal, Dr. Sherry Eppelsheimer, the Intellectual Freedom Award. 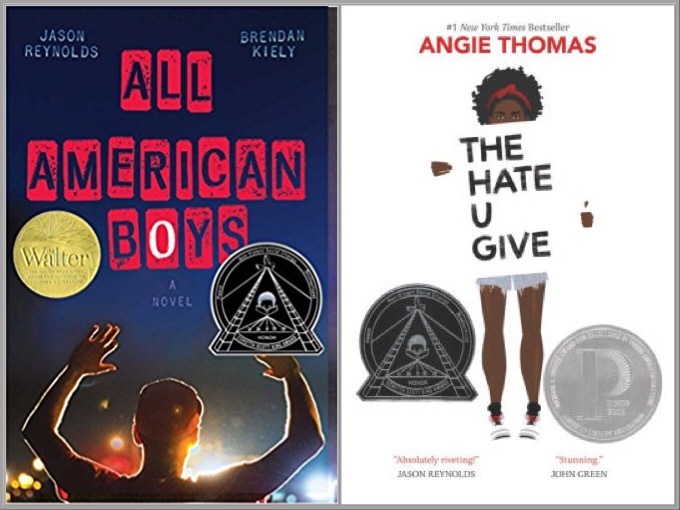 This stems from an incident last year when a Wando High School summer reading list caused a national stir after local police spoke out against the inclusion of The Hate U Give and All American Boys, two YA books that broach with the alarming problems of police brutality. It’s almost an indoctrination of distrust of police and we’ve got to put a stop to that. There are other socio-economic topics that are available and they want to focus half of their effort on negativity towards the police? That seems odd to me. and All American Boys offer insight into the racial injustices many people of color experience and inspiration for young activists who desire change. While not every student may feel prepared to engage such issues, no single parent – or administrator, community member, or police association – should have the ability to deprive all Wando High School students of the opportunity to do so. Rather than restrict your reading list, we urge you to instead encourage your students to read diverse viewpoints and engage them in critical discussion about social issues. In reconsidering these books, we ask that your review committee focus on their educational value as a whole and take into account the fact that the summer reading list already offers alternative readings for those students whose parents may object to the two books under consideration. From the bottom of my heart, thank you — not so much for fighting for my book, but for fighting for your students. At the end of the end of the day, this is what this is about. This is about making sure that all kids get books where they can see themselves or they can see others, whether or not it makes the adults in their lives uncomfortable. Angie Thomas’ debut novel, The Hate U Give, is about Starr Carter, an African American 16 year old girl, who witnesses her unarmed best friend, Khalil, shot and killed by a white police officer. What would be censors often neglect in their criticism of the book is that Starr’s Uncle Carlos is a detective on the same police force and remains a strong counterpoint to the officer who shot Khalil. By claiming this work is “indoctrination” of anti-police sentiment, it shows a willful inability to read the text thoughtfully. All American Boys by Jason Reynolds and Brendan Kiely, tells the story of Rashad, a black teenager, assaulted by a white police officer who mistakingly accused him of shoplifting. The other main character Quinn, a white teenage boy who is very close to the offending officer, witnesses the attack on Rashad. The book rotates between the two boys’ POVs as they grapple with rising racial tensions in their school and community, and figuring out where they stand amid these tragic events. Both books are inspired by the deaths caused by police violence against unarmed individuals plaguing the country in recent years. These deaths have led to large changes in the cultural landscape, creating huge protests, movements like Black Lives Matter, and strong divisions between neighbors based on everything from racial prejudice to gun control. These books offer a chance for teenagers to discuss these real-life situations, opening an important dialogue with their teachers and each other. CBLDF commends Dr. Eppelsheimer for standing up for her teachers, her students, and for the freedom to read. May she be an example to principals in her own state and around the country.